The name Lepiota clypeolaria has been widely used to describe a small to medium-sized lepiotoid mushroom with a brownish cap, a fairly shaggy stem that features a collapsed, sheathing ring or ring zone, and long, spindle-shaped spores. 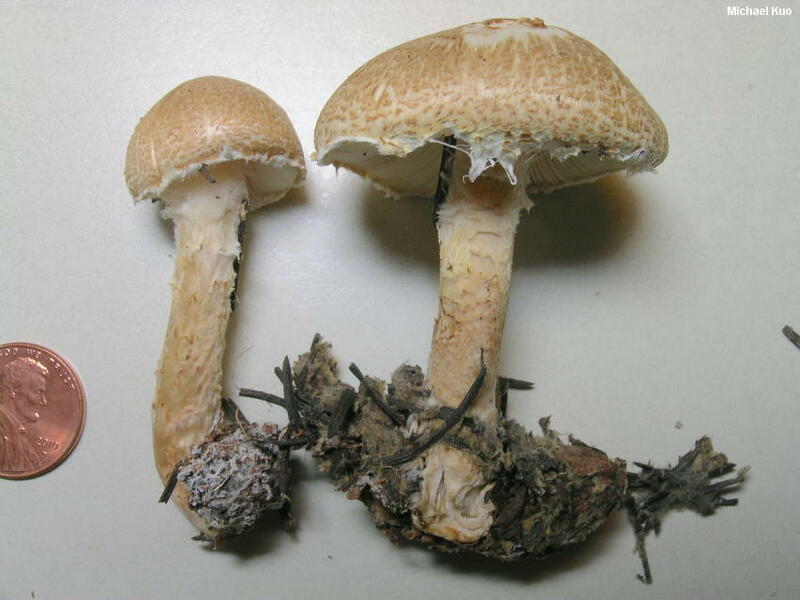 However, DNA research by Vellinga (2000, 2001a) reveals at least two species matching this description: the "true" Lepiota clypeolaria and Lepiota magnispora (which is further divided into at least three genetic groupings). Fortunately, there are physical differences between these mushrooms to help us recognize them without sequencing their DNA: Lepiota magnispora has brighter colors and is more likely to feature a contrasting "eye" in the center of the cap; under the microscope its spores are generally longer and, more distinctively, often feature a flattened abaxial side (the side opposite the direction the apiculus points); the spores of Lepiota clypeolaria are not only shorter, on average, but usually feature a convex abaxial side. 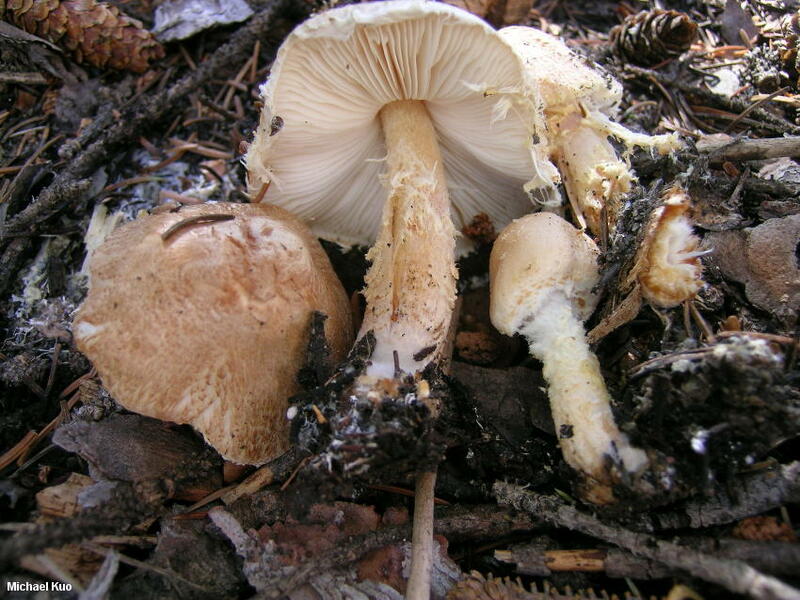 According to Vellinga (2000), Lepiota magnispora is the more common North American species. However, she supports her argument only by speculating about the identity of photos in North American guide books, which appear to her to match her concept of Lepiota magnispora; she does not cite studied collections from beyond the West Coast. My collecting experience supports a different hypothesis. I have only been able to find Lepiota clypeolaria in the Rocky Mountains, and Lepiota magnispora only in California and the Rocky Mountains. In eastern North America I find what appears to me to be a separate species, Lepiota species 01--one that looks quite a bit like Lepiota magnispora, but is somewhat smaller and features spores that match neither Lepiota clypeolaria nor Lepiota magnispora. Ecology: Saprobic; growing scattered or gregariously in forest litter; found under conifers; late summer and fall; North American distribution uncertain (see discussion above). The illustrated and described collections are from high elevations in Colorado. Cap: 3-7 cm; nearly round in the button stage, expanding to broadly bell-shaped or nearly flat in age; soft; dry; fibrillose and appressed-fibrillose overall, with small, soft scales near the margin; occasionally with a bald center; dull orangish brown to brownish or beige; usually fairly evenly colored, but occasionally with a slightly darker center; the margin hung with whitish veil tatters. Gills: Free from the stem; close; short-gills frequent; white. Stem: 4-7 cm long; 6-12 mm thick; more or less equal; bald above the ring; fibrillose like the cap below the ring; brownish; with a sheathing pale yellow to whitish ring or ring zone that often disappears; basal mycelium white, often copious. Flesh: White; unchanging when sliced. Chemical Reactions: KOH negative on cap surface. Microscopic Features: Spores 12-18 x 4-6 µ; boletoid-fusiform; smooth; hyaline in KOH; dextrinoid. 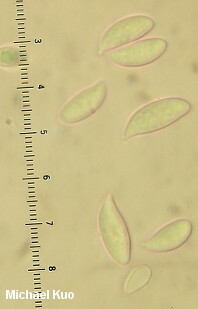 Cheilocystidia inconspicuous and basidiole-like; clavate; to about 40 x 12.5 µ. Pleurocystidia absent. Pileipellis a trichoderm over the disc; elsewhere a cutis; elements 7.5-20 µ wide, cylindric, smooth, orangish brown in KOH, sometimes featuring inconspicuous clamps; terminal cells subclavate to cylindric. REFERENCES: (Bulliard, 1789) Kummer, 1871. (Fries, 1821; Saccardo, 1887; Kauffman, 1918; Kauffman, 1924; H. V. Smith, 1954; Smith, 1975; Smith, Smith & Weber, 1979; Arora, 1986; States, 1990; Phillips, 1991/2005; Hansen & Knudsen, 1992; Lincoff, 1992; Barron, 1999; Akers & Sundberg, 2000; Vellinga, 2000; Vellinga, 2001a; Roody, 2003; Vellinga, 2003; McNeil, 2006; Miller & Miller, 2006; Evenson, 2015.) Herb. DBG ROMO-2012 5023-06, 5026-31. Herb. Kuo 08190701, 08140801, 08201204.